Nivea, the Beiersdorf-owned skin care brand, has launched an integrated marketing campaign as part of its 'Feel Closer' activity to shift brand perception and re-engage women. Created by Life Agency, the UK specific campaign features experiential, outdoor, press, in-store, mobile and digital activity. It uses the strapline, "A million moments of closeness". The campaign is in the first phase of a three-year push. It builds on Nivea’s €1bn global campaign to celebrate the brand's centenary, which used the strapline "100 years of feeling closer" in the UK. The next phase of the campaign is expected to be announced in 2012. 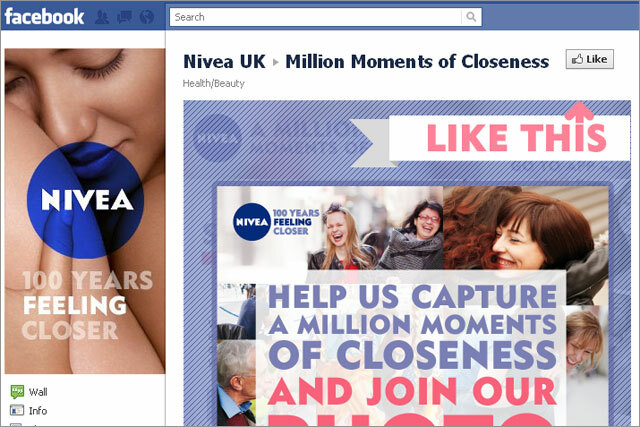 The campaign targets women aged 30-54, encouraging them to share "moments of closeness" through Nivea's Facebook page by uploading photos and liking, sharing and commenting on other people's pictures. An experiential roadshow has toured the UK as part of the campaign, providing a photo-booth area for consumers to have their pictures taken for the Facebook page. The uploaded photos will form part of the brand’s outdoor and press activity. Nivea is keen to explore the perception of "closeness" in the UK and commissioned research in support of the campaign, carried out by Professor Geoff Beattie, head of school and dean of Psychological Sciences at the University of Manchester. David Poole, managing director, Life Agency, said: "Changing views of an established brand en masse is tough. "Consumers think what they think from years of conditioning. This campaign is about moving into a different arena for Nivea and bringing their brand proposition of 'Feel Closer' to Life through every consumer touch-point."